If you are missing a single tooth or multiple teeth, dental implants, offered at our offices in Greeley and Fort Collins, CO, may be just what you have been looking for! A dental implant is a small titanium post which replaces the root of a missing tooth. Once delivered and healed, a dental implant provides a strong foundation upon which a crown or cap may be placed. 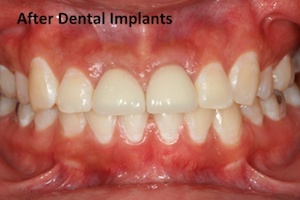 Implants can also be used to anchor complete dentures. Implant-supported teeth look, feel, and function just like natural teeth. Before — This patient's two front teeth were lost, affecting their speech and appearance. After — Lifelike restorations attached to permanent dental implants restored their smile. Dental implants are extremely safe and have been used in dentistry for nearly 40 years. Modern dental implants have success rates approaching 95 percent and have a number of other benefits over traditional treatments such as fixed bridges or removable dentures. With a bridge, your dentist shaves down teeth next to your missing tooth to create space for the restoration. In addition to removing perfectly good tooth structure, shaving teeth down for a bridge may irritate the nerves or increase the risk of decay of the adjacent teeth leading to future root canals or failure of the bridge. With dental implants, the teeth next to the missing tooth are not touched, and since implants are made of titanium they will never decay.With dentures, stability and staying in place during eating and talking is always a concern. Dental implants can be used to stabilize loose dentures, giving denture wearers confidence to eat and smile again! In some cases implants can completely eliminate the need for removable dentures! In some situations where a tooth or teeth have been missing for a long time, the bone at the missing tooth site may have deteriorated, much like an unused muscle that will shrink. In these situations, a ridge augmentation bone graft procedure or a sinus lift bone graft procedure may be needed to provide enough bone to place the implant. In some cases, patients can avoid the need for preparatory procedures with personalized All-on-4® implant placement. Dr. Paris, Dr. Shumaker, and Dr. Allen carefully evaluates each case and will consult with you about what treatment is necessary for an ideal result for your implants treatment. Multiple dental implants with bone grafting. Dr. Paris, Dr. Shumaker, and Dr. Allen are some of the most experienced and qualified implant surgeons in Northern Colorado. Our in-office computerized tomography (CT) scanner allows us to more accurately diagnose and plan treatment for dental implants.Our doctors are board-certified diplomates of the American Board of Periodontology, a specialty which includes dental implant surgery. Additionally, Dr. Shumaker is one of the few Diplomates of the International Congress of Oral Implantologists (ICOI) in Colorado. ICOI Diplomate status is the highest honor available from this international implant organization and is only provided to clinicians who pass a rigorous oral examination and present over 50 carefully reviewed long-term implant cases of increasing levels of difficulty. Dr. Paris, Dr. Shumaker and Dr. Allen are some of the most experienced and qualified implant surgeons in Northern Colorado. Our in-office computerized tomography (CT) scanner allows us to more accurately diagnose and plan treatment for dental implants. Our doctors are proud to place two of the leading dental implant systems in the world: Nobel Biocare® dental implants and BIOMET 3i™ dental implants. These dental implant systems are backed by years of long-term clinical studies with an excellent track record of success. For more information on the world’s two largest dental implant manufacturers visit www.nobelbiocare.com or www.biomet3i.com. If you are missing teeth or would simply like more information about dental implants, please call our office at 970-207-4061 to schedule a consultation, or ask your general dentist for a referral. You can also contact us online through our site to set up your appointment, or to ask us any questions.